Real-time location tracking techniques are a great tool for spatial sound recording, camera calibration and point-of-interest selection in advanced media productions. This review presents the top-four professional tracking systems which work robust indoors and outdoors delivering a tracking precision of down to 15 cm at refresh rates of up to 200 Hz. Real-time location tracking can enrich media-heavy productions and considerably simplify workflows when properly integrated with the production systems. The 2008 production of Puccini’s Tosca at Royal Albert Hall in London, for example, used location tracking from Ubisense for spatial audio sound synthesis in combination with an imaging system. Another example using an Aeroscout installation is a lost children detection system at theme park Legoland in Billund, Denmark. The theme park runs a 65 000 m2 802.11 wireless network and utilizes 38 AeroScout location receivers to locate mobile tags. A rentable wristband containing a tag can be attached to a child’s arm. If the child is lost, parents can send a text message to the system, and obtain the location of their child. In football or other team sports, as a final example, location tracking is used to record the position and movement of players such as ZXY does. Coaches can use this information to improve a team’s performance and TV broadcasters can use the live position to track points of interest or generate video overlays. Different tracking technologies exist which mostly differ in precision, update rate, operation conditions and cost. Low-cost solutions based on (infrared) cameras and image processing achieve decent performance but suffer from difficult lighting conditions, interference, occlusions, and limit the dimensions of a space and the number and speed of tracked persons. Running a single IR tracking system in a small and open in-door space to track a small number of people is reasonable. For larger volumes, higher precision and more tracked users professional tracking solutions using radio transmitters are better suited. Commonly used technologies are Radio-frequency identification (RFID), Wi-Fi and Ultra-wideband (UWB). Although considerably more expensive they even work under challenging operation conditions. This review covers today’s top-four vendors of professional real-time location tracking products: Ubisense, ZXY, AeroScout, and Zebra. All systems consist of one or multiple fixed and calibrated receivers and multiple mobile battery-powered tags worn by people to be tracked. Tags and receivers communicate via propriatary or standardised radio-link protocols. Receiver(s), sometimes called sensors, use highly sensitive antenna arrays to estimate the true position of tags using time and angle of arrival of received signals. Existing standards are IEEE 802.11b with optional Cisco Compatible Extentions (CCX Mode), ISO/IEC 24730-2: Information technology for Real-time Location Systems and IEEE 802.15.4f for UWB. Ubisense (UK) uses Ultra-Wide-Band (UWB) technology, active tags and mounted receivers which use angle-of-arrival and time-of-arrival of the UWB signals to determine a tags position. Moving objects and persons can be tracked in real-time (33Hz to 0.002 HZ update rate) with a 3D precision of 15cm in large volumes (400m² with 4 sensors). An Ubisense tag has a unique ID, is battery powered and small enough to fit into pockets or costumes of people. 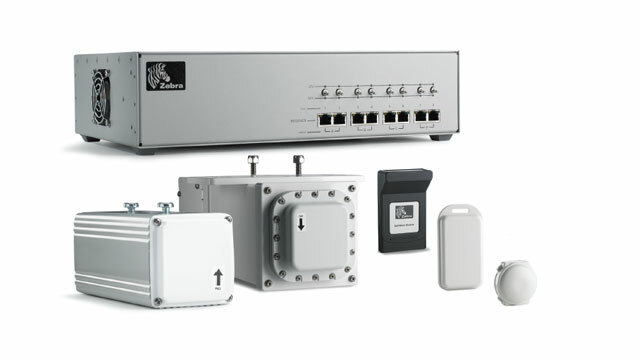 Starting October 2009, Ubisense receivers are equipped with WiFi for cable-less installations. Software is available for Windows and Linux (at least the SDK seems to work under Linux). A forum for research users is available at http://www.ubisense.org. 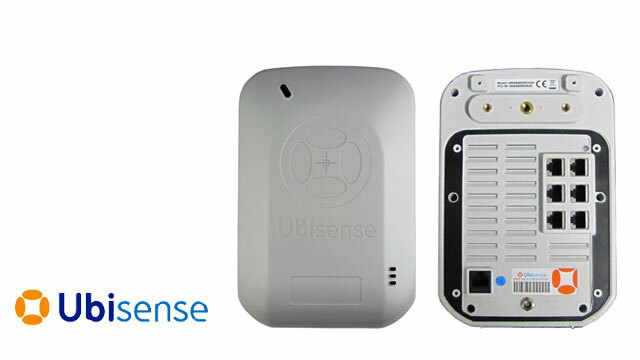 For more information see Ubisense datasheets for Series 7000 IP Sensor and Series 700 Tag. ZXY Sport Tracking (NO) uses Cordis RadioEye receivers from Radionor Communications to track players on football pitches. A single receiver can track the position of up to 36 body tags at a sample rate of 40 Hz across an area of 3000 m² with a precision of less than 1m. The sensors use IEEE 802.11b radio signals at 2.45 GHz (also known as Wi-Fi). No calibration is required and precision can be improved with lower distance between tags and receivers. 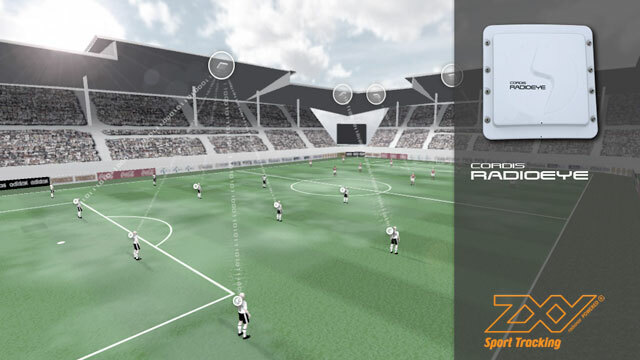 To cover an entire football field ZXY uses approximately 10 receivers placed around the pitch to track all the 22 players at an update rate of 20 HZ. The ZXY body tag additionally records step frequency, movements, and action forces using accelerometers and sends this information to the receivers. ZXY sells their hardware with software tools for game analysis and annotation. Aeroscout (US) manufactures Wi-Fi-based active tags 2.4 GHz IEEE 802.11b transceiver that send their identification at regular intervals (~8 sec) to standard wireless base stations. A central ‘location engine’ software can determine a tag’s location at an accuracy of up to 2m from received signal strength and time-difference-of-arrival. 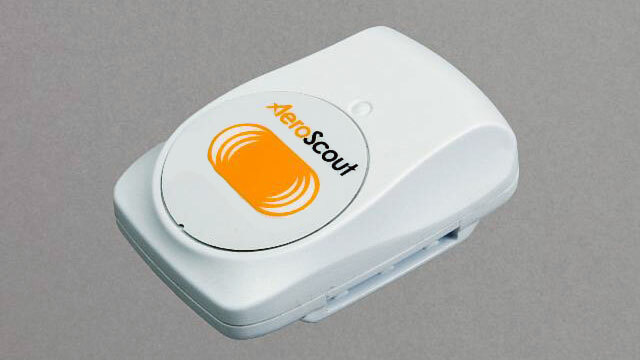 Aeroscout delivers different tags with a variety of features such as triggers, GPS, motion or temperature. Chokepoint magnetic trigger signals operate at low-frequency, short-range 125 kHz. The relatively long update intervals and the low precision make Aeroscout technology unusable for interactive performing arts or sports, but still useful in other tracking scenarios. A scientific publication published at ISWCS 2007, for example, surveys the applicability of Aeroscout T2 tags in a city environment. Zebra (US) manufactures standards-compliant location tracking solutions based on UWB and Wi-Fi technology. Typical locate ranges for UWB are up to 200 m at a precision of < 30 cm and for WiFi about 21 m. Wi-Fi update rates can be programmed to range from 4 sec up to multiple hours, making the tags uninteresting for sports or performing arts. UWB tags update from 200 Hz up to 0.01 Hz (75 sec).